Which college football teams will dominate in 2016? Which teams will have value in the market for win totals? It might seem difficult to answer such questions before the season begins. College football relies on the ungainly actions of hormonal young men. Throw in the randomness of a bouncing football, and it seems unpredictable. However, it is possible to make accurate preseason college football predictions. My preseason rankings come from a regression model that considers team performance, turnovers (both over the past four seasons) and returning starters. The visual shows the top teams, while the list at the bottom gives all 128 bowl subdivision teams. 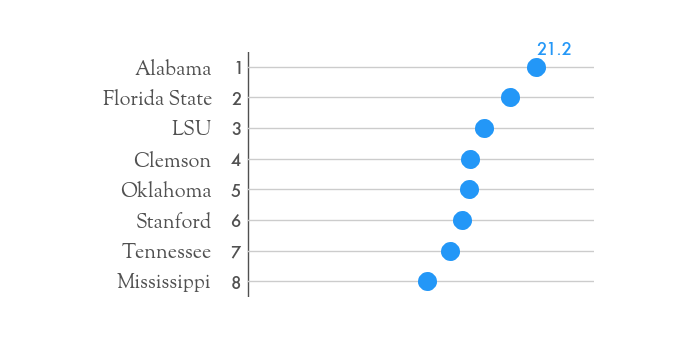 For team performance, I use my college football team ratings. These numbers come from taking margin of victory in games and adjusting for strength of schedule with my proprietary algorithm. Team performance tends to persist from year to year, as Alabama and Rice will never trade places in the college football hierarchy. Hence, the four years worth of team ratings makes up the most important input into the model. While turnovers can greatly impact a team’s rating, turnovers tend to be random from year to year. If a team has 20 more take aways than give aways during the season, they most likely over performed in their rating. The model uses turnovers to adjust this rating down to better estimate the true strength of the team. Finally, teams with many returning starters tend to perform better the following season. When only 6 starters return due to early exits to the NFL draft (Ohio State in 2016), we expect a dip in team performance. How well does the preseason model predict games? The regression model doesn’t account for every factor in evaluating a college football team. For example, it fails to consider whether the starting quarterback returns for this season. Despite these flaws, the preseason model picked the winner in 73.3% of games during the 2015 season. This only includes games between two bowl subdivision teams, excluding the cupcake games with FCS teams. Don’t expect the model to work quite that well again. The firing of Baylor coach Art Briles alone might screw up its predictive ability, and I always encourage you to make subjective adjustments based on situations. However, the model should be solid in 2016. Over the past three seasons, the preseason rankings has predicted the winner in 71.7% of games (1519-599 with no predictions in 144 games). Let’s look at 3 stories based on these preseason rankings that jump out at me. In August of 2015, Ohio State was the toast of college football. Urban Meyer’s team had won the first playoff, and the preseason chatter revolved around his success on the recruiting trail. Then in the most inexplicable game of 2015, Ohio State lost to Michigan State, a team without star QB Connor Cook. The loss cost the Buckeyes a spot in the playoff, and then 10 Buckeyes got drafted in the first 3 rounds of the NFL draft. In contrast, Michigan had all kinds of question in August of last year (2015). They were coming off a 5-7 season, and all hopes rested on incoming coach Jim Harbaugh. Michigan ended the season with a surprising 41-7 win over Florida during bowl season. Harbaugh crushed it on the recruiting path, landing top recruit Rashan Gary and a top 5 class. Now, heading into 2016, many believe that Michigan is a much better team than Ohio State. There are numerous reasons to doubt this. Ohio State beat Michigan in the Big House 42-13 last season. Ohio State’s recruiting over the past four years has outpaced Michigan according to my numbers. Michigan has questions at QB and offensive line heading into 2016. Ohio State has to replace many starters, but one of them is not QB J.T. Barrett. My preseason model has Michigan a slim half a point ahead of Ohio State. It’s too close to call, and Michigan travels to Columbus to play the Buckeyes this year. Stay tuned for my Big Ten East win probabilities. Can LSU contend for a national title? Last year, Les Miles almost lost his job. LSU lost three straight SEC West games, and the Mad Hatter looked like a goner. The LSU administration then suddenly changed course, announcing they would retain Miles after an LSU win over Texas A&M. This might actually make sense, since Miles has averaged over 10 wins per season despite playing in college football’s best division. Now, LSU checks in at 3rd in my preseason rankings, a clear contender for the SEC West and playoff spot. Let’s look at the top reasons. Did I mention Leonard Fournette? There’s only one problem, and he’s the guy taking snaps from the center. QB Brandon Harris completed a meager 54% of his passes last year, allowing defenses to key on Fournette in critical games. Harris looks like a stumbling block for this team. However, he did have off season surgery to fix a sports hernia that might have affected his play late in the season. Also, Les Miles has had success without a star QB. LSU played in 2013 BCS title game despite the maybe average play of Jordan Jefferson and Jarrett Lee at QB. It seems like Clemson should be ahead of Florida State heading into the 2016 season. Clemson beat Florida State on their way to the national title game against Alabama. Despite the 5 point loss against Bama, you could argue Clemson should have won. They dominated the line of scrimmage but couldn’t overcome blown coverages in the secondary. However, my preseason ranking like Florida State, as the Seminoles rank 2nd over Clemson at 5th. The returning starters variable plays a critical role in this rank. Florida State has 17 returning starters, which includes star running back Dalvin Cook. In contrast, Clemson returns only 12 starters. In addition, the Tigers had heavy attrition in the secondary, including 3 players that got drafted by the NFL. In addition, Clemson beat Florida State by 10 last year. However, Florida State had more yards per play than Clemson, an indication of a fairly even game. The Seminoles couldn’t overcome a 2 for 12 rate in converting third downs. However, Clemson might have the trump card. They bring back Deshaun Watson, the best quarterback in the nation. Florida State is still deciding between returning starter Sean McGuire at QB or a few younger players. To get my college football win totals report, available after July 6th, 2016, sign up for my email newsletter. In addition, you get a sample of my college football predictions usually only available to paying members of the site. In 2016, these numbers correctly predicted the winner 76.2% of games. Last year, you had Houston 33rd when they were clearly a much better team than that. They finished 13-1 with wins over four ranked teams (as of kickoff). I believe only one other team can say that. Your system appearently goes way too far on SOS adjustment, just looking at where you ranked Houston, Navy, Western Kentucky, Toledo, Bowling Green, App St and Southern Miss compared to the Massey Composite (all at least two standard deviations above the consensus). San Diego St, La Tech and Memphis were almost two standard deviations above the consensus, and Temple was one standard deviation above. You lose all credibility with rankings so far afield like that. The brutal truth about college football is that the best teams reside in the Power 5. Houston had a great year, and they might do it again like Memphis did last year. Houston is probably better than 41st. I think that’s a reasonable assessment with Ward coming back at QB. But I wouldn’t put them in the top 25. So App State goes 11-2 last year, ends up 33 in AP, returns 17 of 22 starters , picked to win the Sun Belt and you rank them 85th going into this year? You’ve got to be joking! App St outplayed and should have beaten Tennessee. To anyone watching, that was no 7 vs 85 match up. Once again, more proof of Feng’s flaws. Why don’t you wait and see what happens against OU before you start telling a guy that he has no credibility? You might be right, but let’s play a game first. Well, we saw didn’t we, Stephen. Confirms Feng’s complete lack of credibility. Do you have a FB page that has these articles or is everything just on this website..
Don’t use the FB page at all, everything is on the site. The best teams reside in the P5? That’s your rationale for the systematic discrimination of the top G5 teams in your rankings compared to the norm? I went back and checked. The brutal truth is that over the last 4 years combined, I only found 2 G5 schools in your final Top 30. Clearly, there is something very subjective at work in your rankings. You’re system is rife with your opinions, whether it’s how to adjust for SOS or how much credence to give recruiting rankings (which are themselves subjective and incomplete — in that they don’t account for transfers). There is zero subjective factors that go into any of my rankings/ratings. When Boise State had Kellen Moore, they were in the top 5 of my rankings because they beat good teams and destroyed bad teams. And they did this for years. If another G5 team has the same consistent success, they will also appear near the top of my rankings. And to correct Parker on a couple points, recruiting rankings do account for JC transfers, and there are far more of those than “regular” (and grad) transfers. Concerning Massey, many of the component systems do very little assessing of football-related changes from the end of one season and the start of another. They are much more driven by pure quantitative methods and not football. You say that your model “considers team performance, turnovers and returning starters”, but then you say that Texas A&M’s rank was adjusted for “schedule”. What does that mean? Were they higher or lower than #10 before the adjustment? Does a tough schedule move teams up or down? I’m trying to determine if this is a “power” ranking or not. Power rankings merely tell which of two teams would win if they played on a neutral field. Schedule does not matter, wins and losses do not matter. It’s a power rank in the sense that the higher ranked team has better than a 50% chance to win on a neutral field. College football requires making adjustments for schedule, and I do that with my algorithm. Those are two conflicting ideas. Let’s take an extreme example to make my point. You are saying that A&M would be expected to beat Ohio State on a neutral field. Then for some reason A&M has to re-make their entire schedule, and end up with a schedule versus the 12 WORST teams in the country. With that, you need to adjust your rankings. Then for some other reason, those 12 worst teams cancel their agreements with A&M, and A&M has to re-make their entire schedule again, and end up with a schedule versus the 12 BEST teams in the country. With that, you need to adjust your rankings again. I don’t know how your rankings would change, but in one of those two scenarios, A&M would HAVE to get re-ranked BELOW Ohio St. So then your logic would CHANGE, with A&M expected to LOSE to Ohio State on a neutral field. And yet neither TEAM changed, only their SCHEDULE changed. I hope you understand. These are NOT power rankings, because power rankings have NOTHING to do with schedules, and in fact the schedules make it mathematically and logically incorrect, as I’ve shown. You just exposed Feng’s fatal flaw, and the reason he so badly misranks G5 teams.